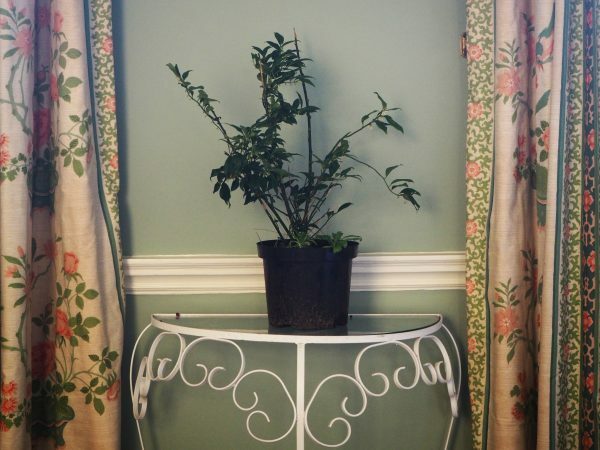 It can be difficult to find the right indoor garden pot for your newly fashionable house plant. The chain stores, such as B&Q and Ikea, do a good line in white china indoor garden pots, and also some trendy ribbed and patterned neutrals. And James Wong told me that in London there are wonderful garden centres run by ‘hipsters with post-ironic beards’, which are great for house plants and indoor garden pots. Here in Faversham, we do have hipsters with post-ironic beards, but I think they’re mainly brewing their own beer or playing jazz in basements. They haven’t quite got around to indoor plants, except possibly of a certain grow-your-own variety. My mantelpiece with a cyclamen in its standard pot. Exactly the same scene but this time the cyclamen is in one of Plant Furniture’s pots. In the 1970s there were dozens of factories in Germany and Scandinavia making these kind of pots, but by the time James discovered them, there were only a few remaining. They’re very well made, with a soft base that won’t scratch your furniture. James points out that terracotta pots are permeable, so when people use them inside, they can leave watermarks. So if you’re thinking of bringing your outdoor garden pots inside, then do protect your surfaces if necessary. Another ‘before’ – in its garden pot. And in its Plant Furniture 1970s pot…. 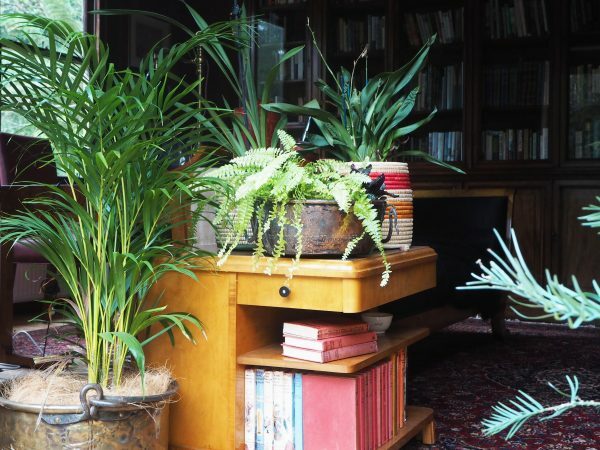 I would point out that I didn’t have any larger house plants – and I couldn’t find them locally. So I simply fished a Sarcococca Confusa out of a corner in the garden where it had been dumped in its pot. 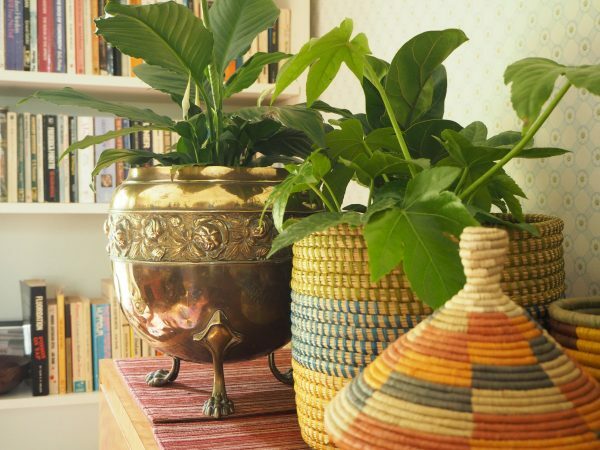 A beautiful aspidistra or parlour fern would look even better. But it does show that the pot can make even a an insignificant plant look really quite special. We do have alot of charity shops in Faversham, plus some great junk, vintage and antique shops and markets. So I trawled them for house plant pot ideas. However, you can’t rely on finding particular things in a charity or second-hand shop. It is a bit random. 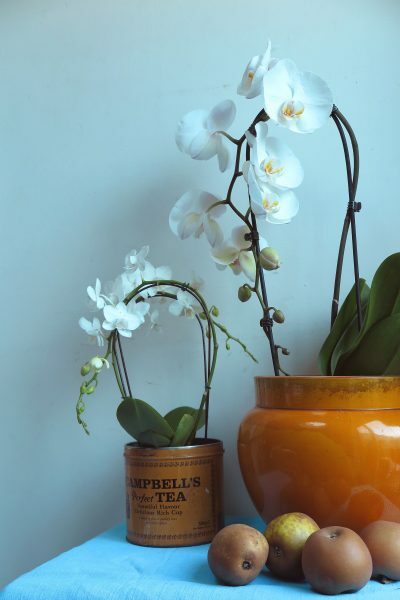 These vintage planters came from car boot fairs – you just need to be patient, and go to lots of car boot fairs or garage sales to find the right ones. However, be patient. 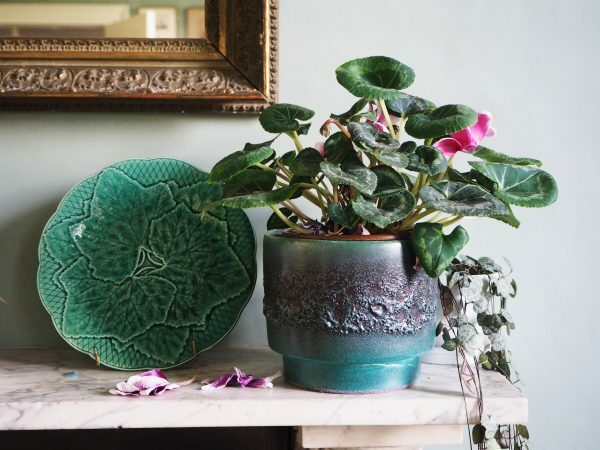 Re-visit the charity shop or go to the car boot fair or garage sale whenever it’s on, and you’ll find the perfect pots in the end. However, I found a wonderful collection of brass and copper planters in a friend’s Victorian house. My friends’ copper and brass Victorian planters, bought by leaving an alert with a local auction house. They place an alert for ‘copper pots’ and ‘brass pots’ with the local auction house. When one comes up, they leave absentee bids and stick carefully to their budget. That’s usually £20-£30, or a bit more for a big one. My friends say that they only get about one in five of the pots they bid for, but over time, that’s built up to quite a collection. 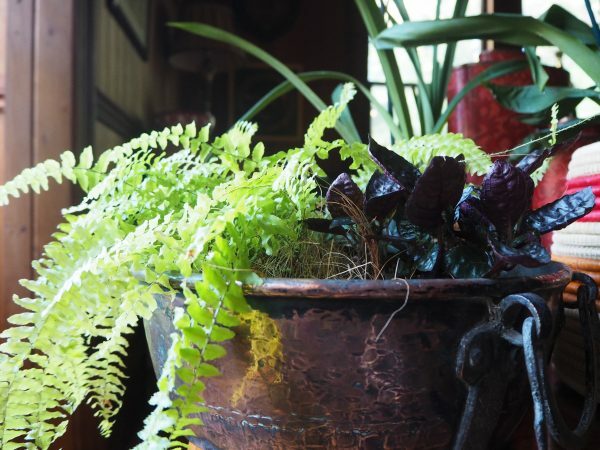 I love the texture of this beaten brass pot with the fern. Their house is Victorian. 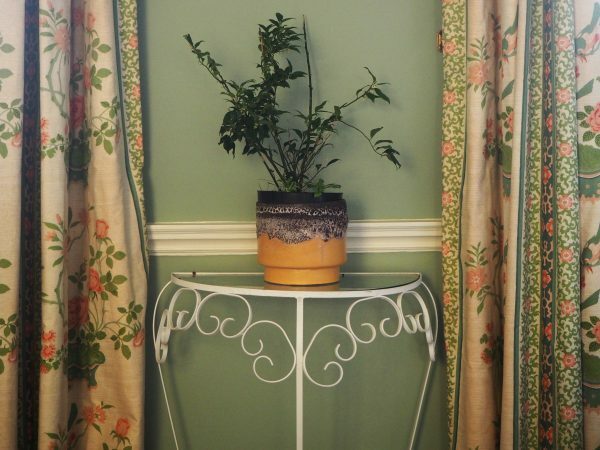 That was the great age of exotic indoor plants, so it really suits the house. But it would also contrast well with a more modern look. The same friends go to various parts of Africa for work. They bring back baskets made by local women’s collectives and use them as containers for house plants. Baskets woven by women’s collectives in Uganda, plus one of the auction house brass pots. Baskets are easier to bring home than china! 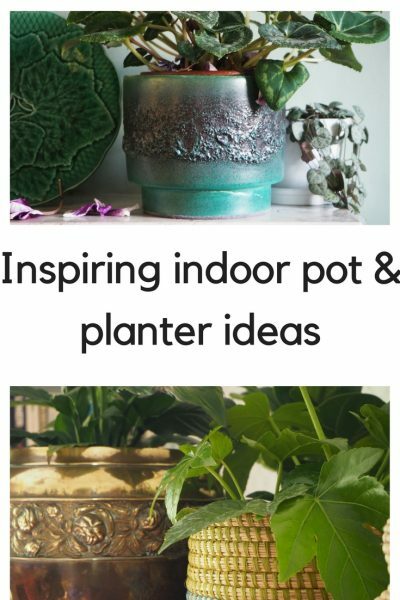 Let me know your suggestions for beautiful indoor garden pots. 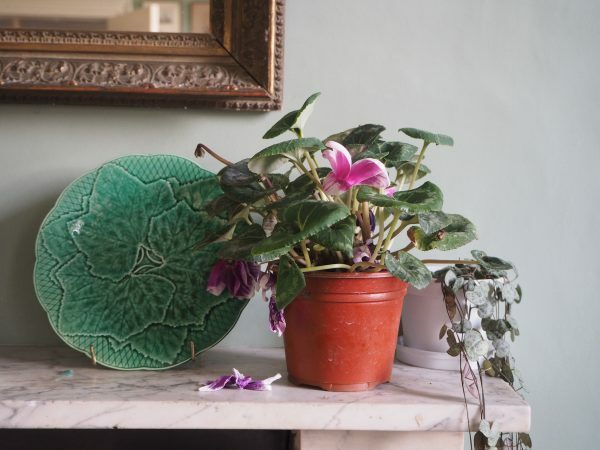 I originally found James Hemsley and Plant Furniture because he commented on my post on the 1970s house plant revolution, so it is worth commenting and reading the comments in a blog. You never know what you might find.